Oh, you're not going to be like that are you? Would "south and east of Wolverhampton" be more helpful? How about this map here? Yes, it would, thanks. Now, what's the story here? For such a short, unbuilt motorway the story's actually quite interesting. The motorway was designed to allow traffic from Wolverhampton and the industrial Black Country easy access to the national motorway network. A version of it was finally completed in the 1990s, but to a lower standard than originally envisaged. The first tentative plans for a motorway along the route were made public in February 1962. At this stage it included the possibility of a connection to M5 - something that became reality in the late 1990s when the Black Country Spine Road was completed. However, the story starts before that - back when the M6 in the area was still referred to as the "Walsall West Bypass" and wasn't even a motorway (or Motor Road as they were referred to at the time). A road is mentioned in the 1951 Staffordshire County Development Plan that is easily identified as a prototypical Bilston Link Motorway - running from the A4123 Wolverhampton - Birmingham New Road to the south of Bilston and Willenhall Town Centres to meet the Walsall West Bypass in the Bentley area. In addition to this, a second major new route (which would later be tentatively upgraded to motorway status in some reports) was proposed in the same area. This route would have gone from the Ettingshall area via Wednesfield and headed roughly parallel to, and to the north of, A4124 to meet the A5 at Brownhills. This second route was always seen as a lower priority than the Bilston Link - and as such has still not seen the light of day. It was still generally kicking around as an idea for many years, but it appears to have finally been canned in 1979 in favour of what was called the "M54 Extension", which eventually transformed itself into the A446(M). There is still the evidence on the ground for part of this second route - there's a fairly obvious gap through suburban housing in Wednesfield that has never been filled. That's an interesting aside, but what of the Bilston Link Motorway, eh? As I mentioned, in 1962 the first tentative motorway proposals were published. Things seemed to be going well for a while - in 1964 the Bilston Bypass (a motorway spur from the main route) from Millfields Road to Dudley Street, connecting to the new motorway was approved to proceed, with construction due to start in 1966-67. Oddly enough, it didn't happen. 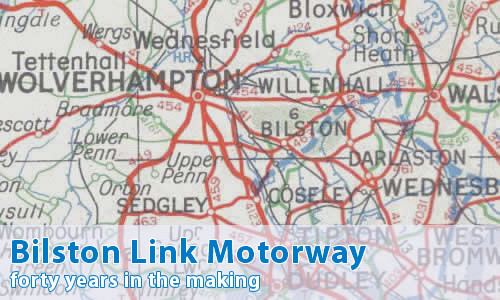 By 1968, the Bilston Link Motorway had begun to appear as a proposed motorway on maps, and construction was due to start in "the next two years". Finally, construction of something started in the early 1970s. The first section of the Willenhall Bypass, The Keyway, was constructed to urban motorway standards - though it opened as an all-purpose route. This initial section ran from the A454 to the A463, and was part of the spur that led towards Wolverhampton City Centre from the Bilston Link Motorway. Then... Nothing. No, nothing. The road was left as a oversized section of the route leading from Wolverhampton to the M6, and was left with short stubs pointing hopefully towards the Bilston Link route. However, hope that the deadlock might be broken came in 1982, when it was proposed that the Bilston Link Motorway should become Britain's first Toll Motorway. The toll would have been levied for 20 years, at which point the route would have changed to the ownership of the relevant local authority. However, this idea was rejected. After much wrangling, the section of the main route that lay within Walsall MBC began construction. Walsall MBC had not looked favourably on the project, proclaiming that they could not see why they should be expected to pay towards a road that would not benefit Walsall - conveniently forgetting that the towns of Willenhall and Darlaston lay within the Walsall MBC area. The section to the east of Bilston was constructed to urban motorway standards, with fully grade separated junctions to the east of the A4444, and with provision for future grade separation built onto the A4444 junction itself. However, in order for the construction to proceed, roughly half the Keyway extension that was less than five years old needed to be ripped up. Because Walsall MBC had constructed it straight over the line of the main route.